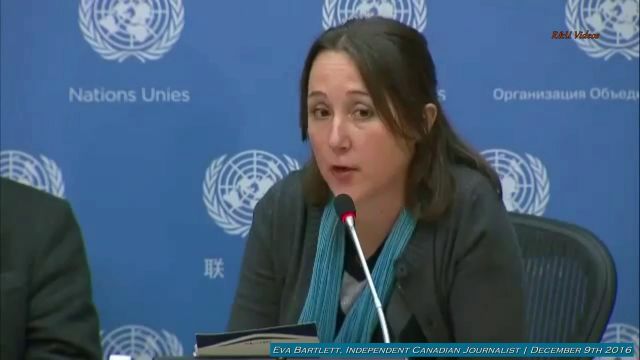 In this vitally important video (scroll down directly below this short 5-paragraph article) from a United Nations Dec. 9, 2016 press conference, independent self-funded Canadian journalist Eva Bartlett (who, like UK-based independent journalist Vanessa Beeley, has spent considerable time on the ground in Syria) tells a drastically different story about Syria than we hear from the orthodox press. Ms. Bartlett has talked to everyday Syrians and closely witnessed various events and developments, including deadly attacks carried out by terrorist factions that appear to have Western backing, even while the vast majority of conventional corporate media, she maintains, engage in a series of nonstop lies that amount to a vast deadly deception, thereby perpetuating the death and suffering of the long-besieged Syrian people. 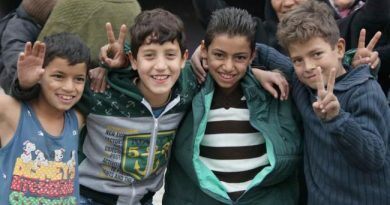 Incredibly, the actual, long-awaited liberation of much of the Syrian city of Aleppo finally happened after terrible suffering on the part of the Syrian people, thanks to Syria’s government and military with Russian assistance—despite the fact that corporate Western media (U.S., UK, Canadian, European) wrongly (and apparently intentionally) portray Syria’s leadership as the real villains, as Ms. Bartlett says. See this video for yourself and you decide. By all indications, Ms. Bartlett exposes the hand of the “Weaponized Media” that’s operating today, owned by large corporate interests interlocked with “deep state” government insiders who will do anything to maintain power and profits. This kind of media, clearly, is never going to “speak truth to power” because it’s part of the very power structure it claims to monitor. So, such a media simply does not and CANNOT work in the true interests of the people and their well-being and freedoms. Such a media must be replaced. At last – the real ‘truth’ coming out – for these deliberate lies and the subterfuge of hidden agendas behind such lies has gone on for centuries with the same ‘voices’ and ‘families’ and ‘status-holders’ behind it all. The MSM are now become ‘presstitutes’ and the people of the world are beginning to wake up to it – the liars and cheats within high geo-political, industrial and banking circles must be further exposed – for the betterment of our world and our living in it.